Originally I was planning to go to Ossett Albion v Mossley but on checking the non-league paper on Sunday I found that it had been moved to the Wednesday due to the crunch England v Poland game. I double checked the site as the non-league paper often gets stuff wrong but to my dismay it was true. I had been looking forward to this one especially as they had a good club shop and I had been planning to meet people there. So at short notice, I started looking for an alternative. It was then that I discovered how rubbish that the public transport system was. The only doable one on the bus or train was Liversedge v Nostell Miners Welfare. And even that would involve a right pain in the backside journey where I had to change bus in an unfamiliar area. After my own towns transport had let me down recently when I knew exactly what I was doing, I decided that if possible, I would limit my drinking during the afternoon and drive to Frickley Athletic v Kings Lynn Town. I was also considering Witton Albion and Nantwich Town but Frickley was the nearest and therefore won the day. On the day I had planned to go into town and go round the shops and check out a couple of pubs. I was really pleased to kick off the day with a great bargain. From Cash Generator I managed to pick up The Great Escape game for the xBox as well as the first Oasis album and a Capital Gold Greatest Hits CD, all for £1.39. True to form, I had forgotten to bring something with me, this time my toothbrush. So I went to Home Bargains and got one as well as a few other bits. By then, it was pub opening time at 12 and so I made my way to the first port of call, the Sportsman. There I had a couple of pints of cider from the decent Pure North brewery, namely Katy and Valley Gold. I then went and got myself some lunch and finished looking around the shops. It was still only 2 o clock and so I killed some time by going and looking at Huddersfield's stadium, scene of a Wycombe horror show on one of our visits as we lost 6-0. We even repeated the trick at home around a year later, both embarrassing performances were captured live on Sky, with the second being especially painful. I spent the afternoon back in my room relaxing. I watched The Chase on ITV1 and left for the game at 6. After a slow start getting out of Huddersfield, the journey went fine and I was at Frickley's ground in South Elmsall just before 7. After listening to an extremely annoying Kings Lynn fan use the phrase 'hashtag' to describe 10 things within 90 seconds I decided to support Frickley Athletic for the night. After getting some pictures of the ground, including a fantastic mural, I went and had a look in the club shop. 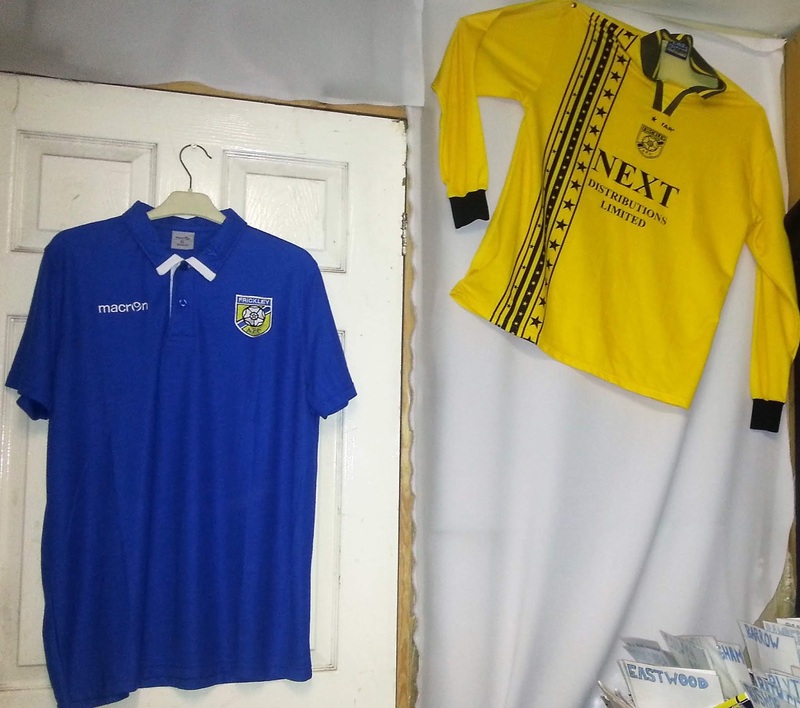 I was very tempted to get an old shirt for a fiver but I would never wear it and that I would have nowhere to display it. So I settled for a pen for a quid. 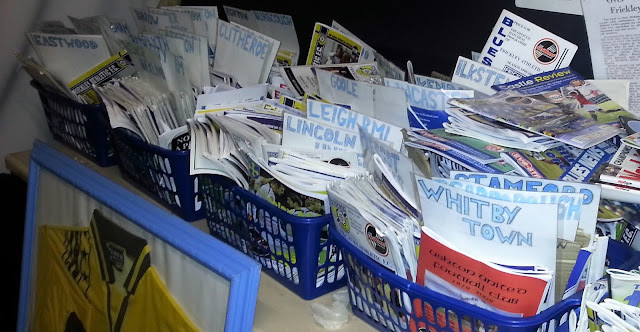 They also had a large selection of old programmes and a few books too. I took some more pictures and took a seat in the stand. Some fans from Frickley saw my coat and thought I was scouting for Brigg Town, their opponents on Saturday. I told them I was from Wycombe and they were very welcoming as most clubs are at this level. They got me a team sheet which was useful for seeing who had scored. They also had a fantastic set of younger fans who got behind their team all night with some good chanting. 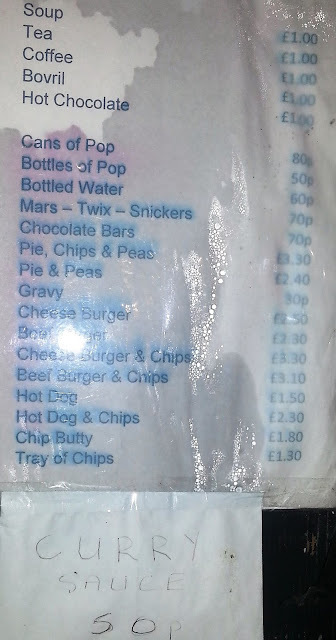 The tea bar was very good too, I had chips and gravy and then pie and peas, both of which were very nice. 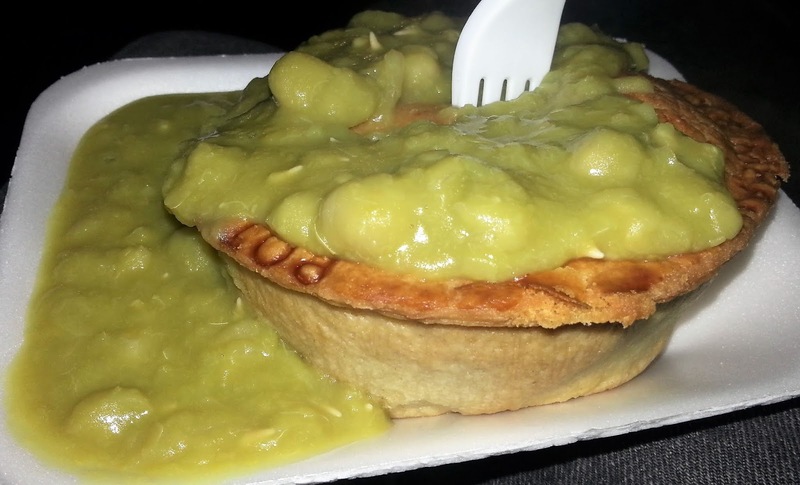 The pie especially was nice and big and had a lovely crust. The peas worked well with it to give it moisture. 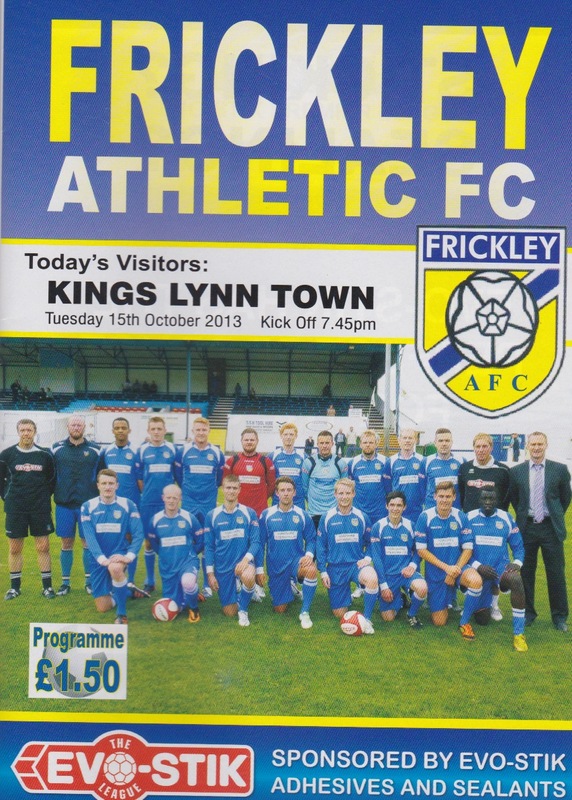 In front of a crowd of 196 fans, Frickley probably should have had a win. Certainly striker Gavin Allott aided the cause with 2 goals, one from the penalty spot, this sealing his place at the top of Frickley's top scorers' list and indeed amongst the front-runners in the NPL Premier Division too. Jake Jones and Andrew Hall, the latter a penalty in the last 10 minutes got them a point. 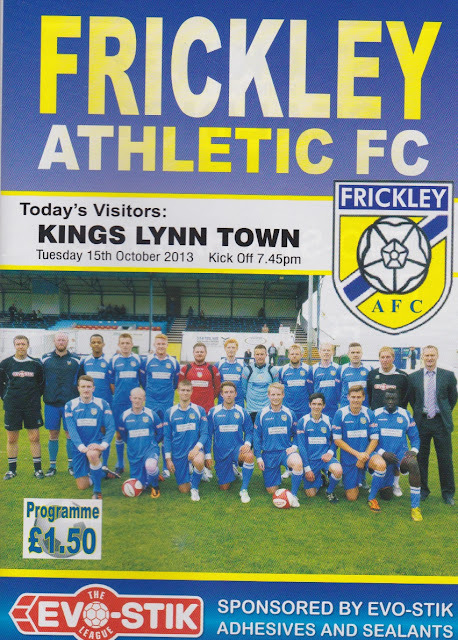 No team dominated entirely, but Frickley were the better side overall. After the game, I got in the car and listened to the last bit of the England game, which happily we won 2-0 against Poland, and therefore qualified for the World Cup in Brazil. It was another easy drive home and I got home in plenty of time to have the cider that I had not tried at the Rat and Ratchet pub which was 20 minutes walk from my hotel. I got back around 11.30 and was disappointed that this would be my last day for a while up North. My Travelodge room had been perfect with a great location and the room was really nice too, especially considering it was only £23 a night. I'd say that it was the nicest Travelodge that I had stayed in, being pretty new compared to the other ones I had stayed at. THE WESTFIELD LANE STADIUM is a traditional non-league ground, that is becoming ever rarer these days. The big main stand is the main feature of the ground, offering an excellent elevated view despite some pillars. Opposite that is a covered terrace, while both ends are basic uncovered terraces. By the looks of it, you used to be able to stand on the grass banks behind too, but there has since been fencing put in to stop you doing this. Probably due to some daft health and safety rule no doubt. As mentioned above the club shop is good, with lots of stuff to chose from and bargains to be had. The tea bar is excellent also with a nice range of tasty food. The bar is fairly small by nice and modern with your typical selection of drinks. The town is nearby if you want a wider choice.